It’s time for stop three on our virtual vintage voyage! Pack a bag we are going on a roadtrip. Think of your perfect vintage camper trailer, the classic car you want pulling it and that’s our ride this week. We’re off to California, America to meet Paul Lacitinola from Vintage Camper Trailers! For the month of June we are taking you on a virtual vintage tour of the world. Each week you’ll meet someone who is living in vintage life in different countries. 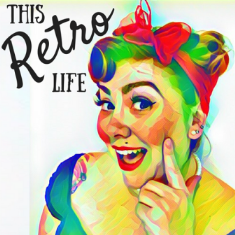 You’ll get to hear about their local vintage scene and be inspired by their retro events. Our first stop is Barcelona, Spain to meet Miss Sixties Twist. Dr Colleen Darnell in Egypt with a 1970’s Land rover in front of a house built in 1906! So every week on the podcast I nerd out a little. I can’t help it. I get to talk to my people! Those that share a passion for vintage and who have incredible collections or have achieved amazing things. But this weeks episode pushes my nerdy fan girl to the very edge! This week we aren’t just talking to a beautiful 1920’s dame, you get to meet an Egyptologist with an incredible vintage flare! Ladies and Gentlemen, meet Dr Colleen Darnell!!! Today we are going op shopping!! We are heading to the beautiful city of Melbourne to go on a tour of some of the best op shops with Ellen Hookey. Ellen is the brilliant mind behind the Op Shop ‘Til You Get Enough tours. She took her expertise as a tour guide, combined it with her personal love of hunting for a bargain and runs three different tours throughout the month. What do drag racing, victory rolls and a vintage dressing room all have in common? Meet Miss Dale Velvet Rose. A pinup model and competitor living on the mid north coast of New South Wales in Australia.